Can Citizens Learn What They Need to Know? Most citizens seem underinformed about politics. Many experts claim that only well-informed citizens can make good political decisions. Is this claim correct? 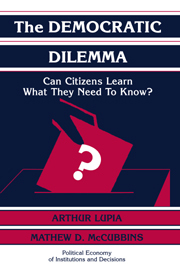 In The Democratic Dilemma, Professors Lupia and McCubbins combine insights from political science, economics and the cognitive sciences to explain how citizens gather and use information. They show when citizens who lack information can (and cannot) make the same decisions they would have made if better informed. As a result, they clarify the debate about citizen competence. List of tables and figures; Series editors' preface; Acknowledgements; 1. Knowledge and the foundation of democracy; Part I. Theory: 2. How people learn; 3. How people learn from others; 4. What people learn from others; 5. Delegation and democracy; Part II. Experiments: 6. Theory, predictions and the scientific method; 7. Laboratory experiments on information, persuasion and choice; 8. Laboratory experiments on delegation; 9. A survey on the conditions for persuasion; Part III. Implications for Institutional Design: 10. The institutions of knowledge; Afterword; Appendices; References; Author index; Subject index.